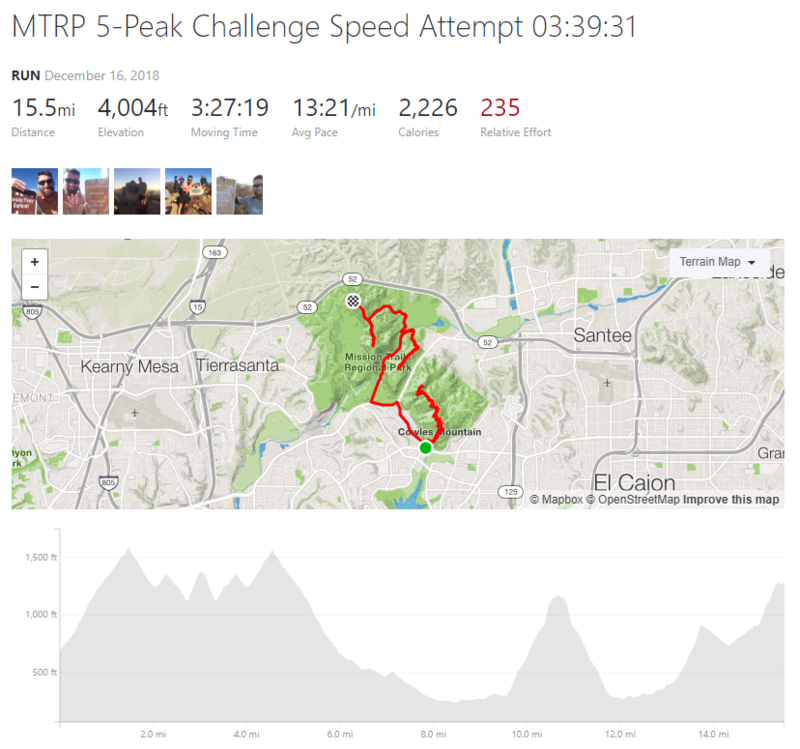 Welcome to the 5-Peak Challenge! 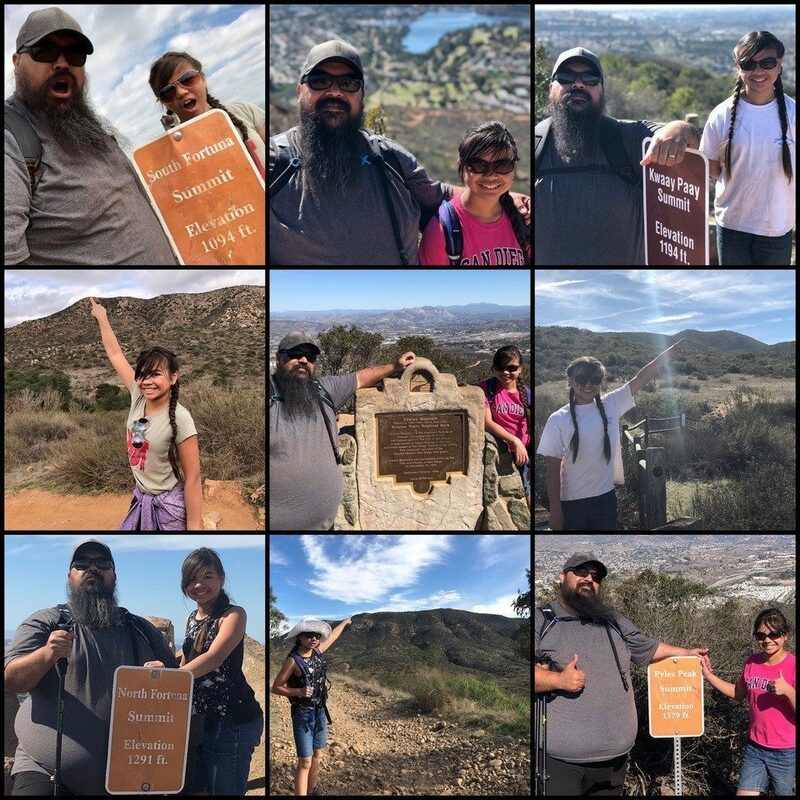 Using the 5-Peak Challenge Trail Map complete the challenge by hiking to the summit of all five peaks (on authorized trails only – no hopping over/crawling under fences or cutting switchbacks as a “shortcut”) in any order and within your own timeframe. This will provide you the opportunity to discover some of the less-visited areas of the park. 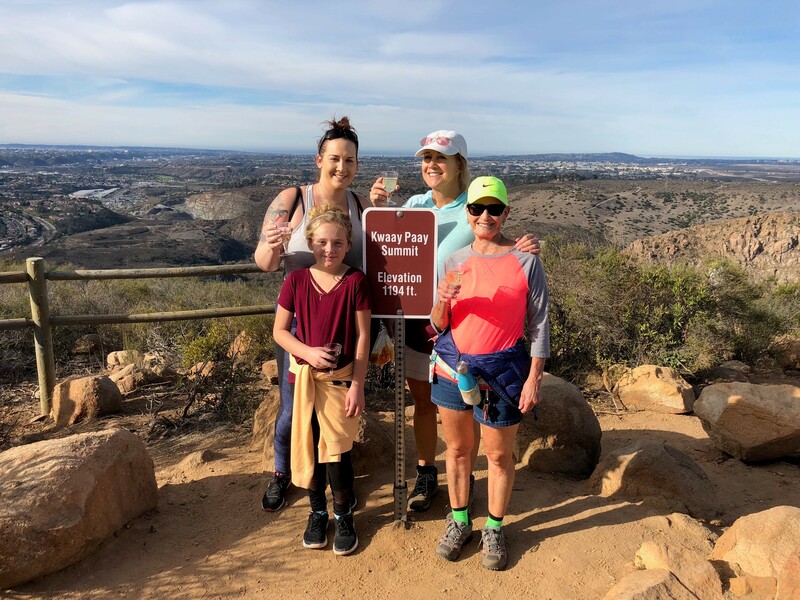 After completing the 5-Peak Challenge, not only will you have seen San Diego from different perspectives, but you may also adopt a new favorite hiking trail along the way. Take your time, you do not have to complete the challenge all in one day. 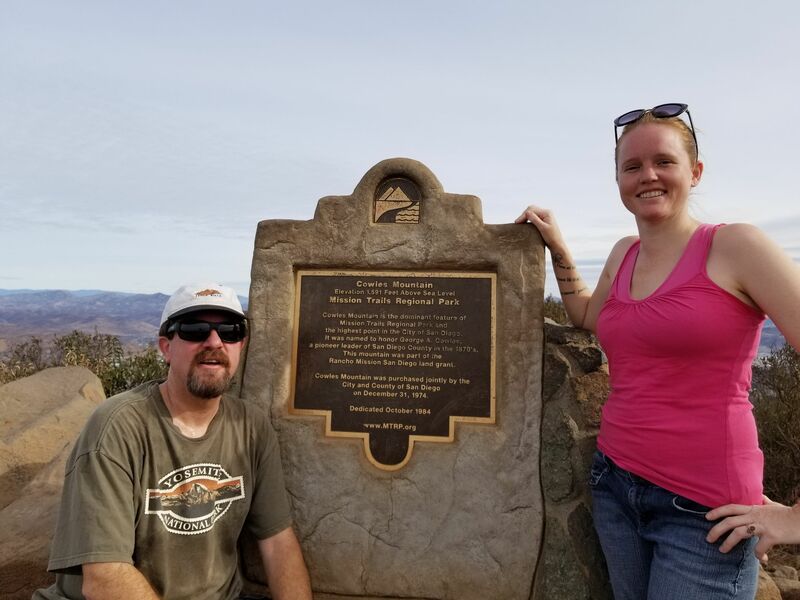 * Hike to each summit and take a picture of yourself next to the sign at each summit – make sure you get at least part of the peak’s name in the photo with you. 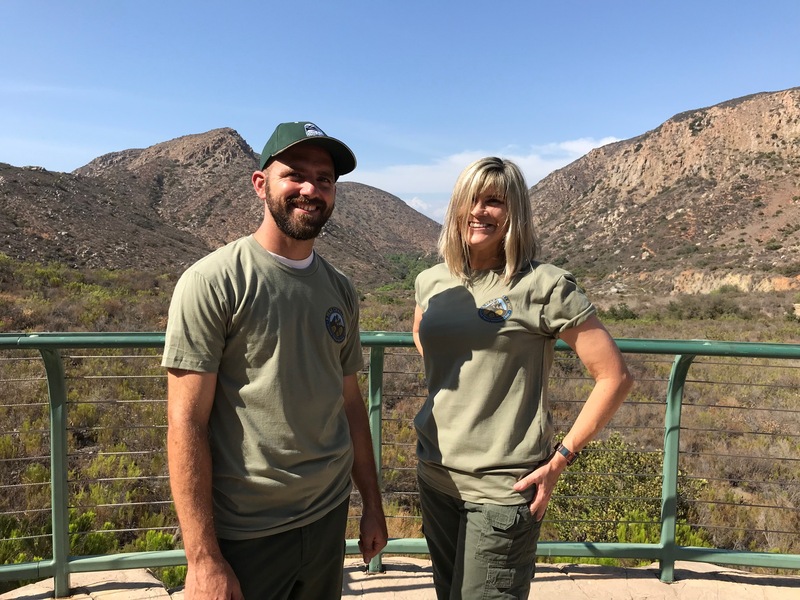 * After you are notified, stop by the Visitor Center front desk between 10 a.m. and 4 p.m. to receive your official 5-Peak Challenge certificate and logo pin. Please be sure to let the staff at the front desk know you have already had your photos verified and that you are there to pick up your rewards. The Visitor Center is very busy at times, especially on weekends, so your patience is appreciated while waiting for assistance. * Encourage your friends and family to complete the challenge! * Lone hikers: feel free to use our Facebook Page as a forum to connect with potential hiking companions. 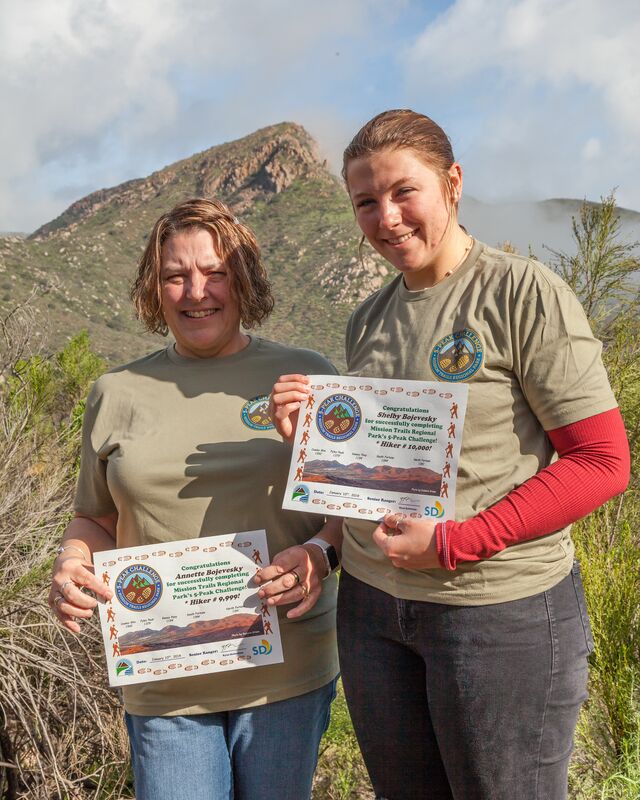 The 5-Peak Challenge officially kicked off at 10:00 a.m. on Saturday, November 7th, 2015 with a press conference at the Kwaay Paay trailhead, just west of the Kumeyaay Lake Campground. San Diego County Supervisor Dianne Jacob, San Diego City Councilmember Scott Sherman, and La Mesa City Councilmember Kristine Alessio welcomed and honored a group of hikers (who had previously completed four of the five peaks) as they finished their last peak to successfully complete the 5-Peak Challenge. 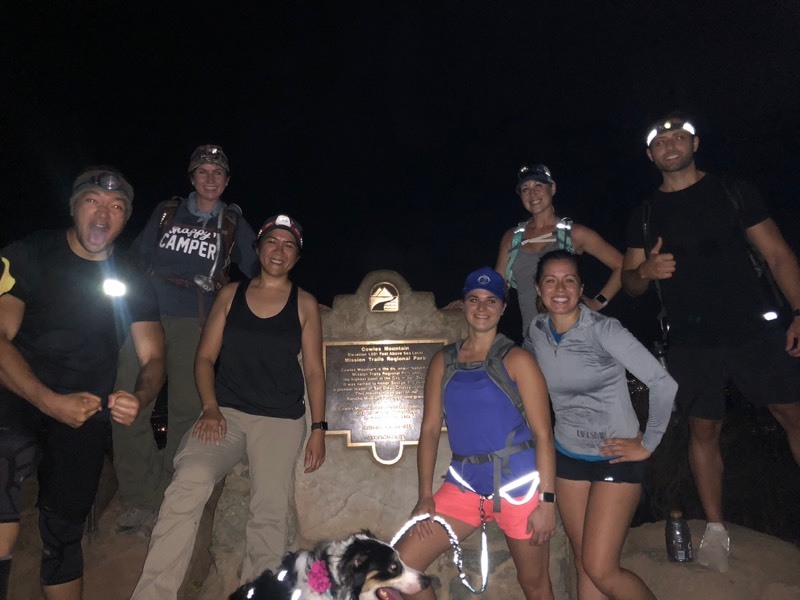 The first 100 people to successfully complete the 5-Peak Challenge were entered into a drawing for 10 prizes generously donated by REI, Adventure-16 and Lightspeed Outdoors. The winners (in photos below) were presented their prizes at a small ceremony held on Saturday, December 5th, 2015 at 11:00 a.m. in the Visitor Center Theater. 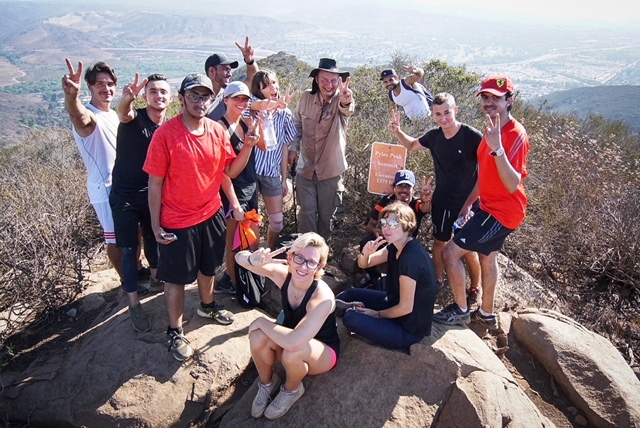 On November 27th, this group of 16 from L.A., Orange and San Diego Counties, met up through Instagram and completed the 5-Peak Challenge together all in one day! They were #’s 499, 500 & 501 to complete the challenge! 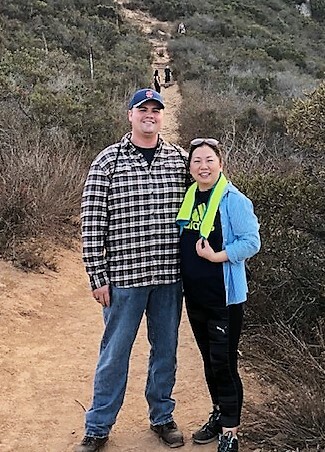 Cynthia Guerrero, on top of and below South Fortuna (with Ranger Chris on right), became the 1,000th person to complete the challenge on January 20th – way to go, Cynthia! We’ve already earned our pin and certificate (we love doing the peaks!). This past Monday we decided that we wanted to attempt to do all 5 peaks in 1 day. Several hours later, I am happy to report that all 5 peaks were reached! Thank you so much for all your hard work in keeping the park so accessible to everyone and for keeping it so beautiful! 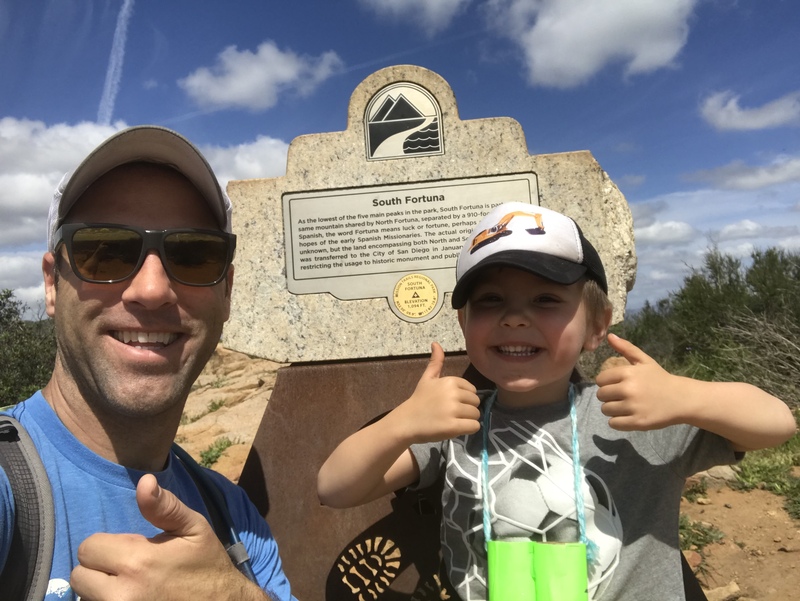 Up until March 11th, 2016 the youngest person to have completed the 5-Peak Challenge on their own feet (without having to be carried by their mom or dad) was a 5-year-old girl; that honor now belongs to a 3.5-year-old boy! became number 2,000 to complete the 5- Peak Challenge! My name is Thomas Nguyen and my son’s name is Jacob Nguyen (9 years old). 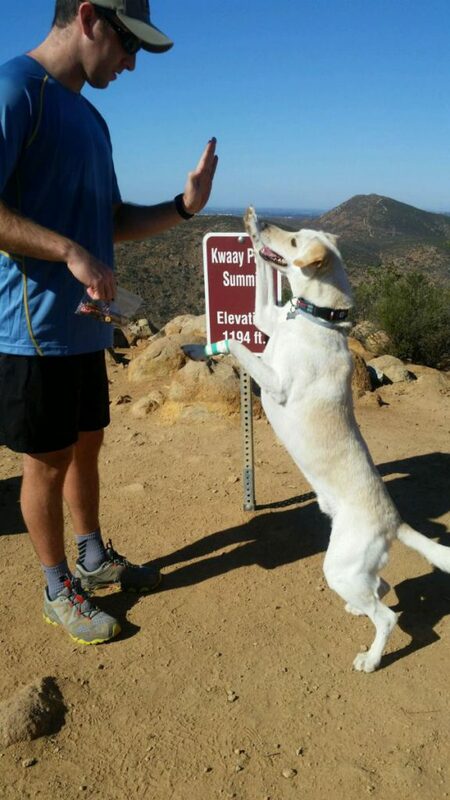 We recently completed the 5 Peak Challenge on 4/16/16. 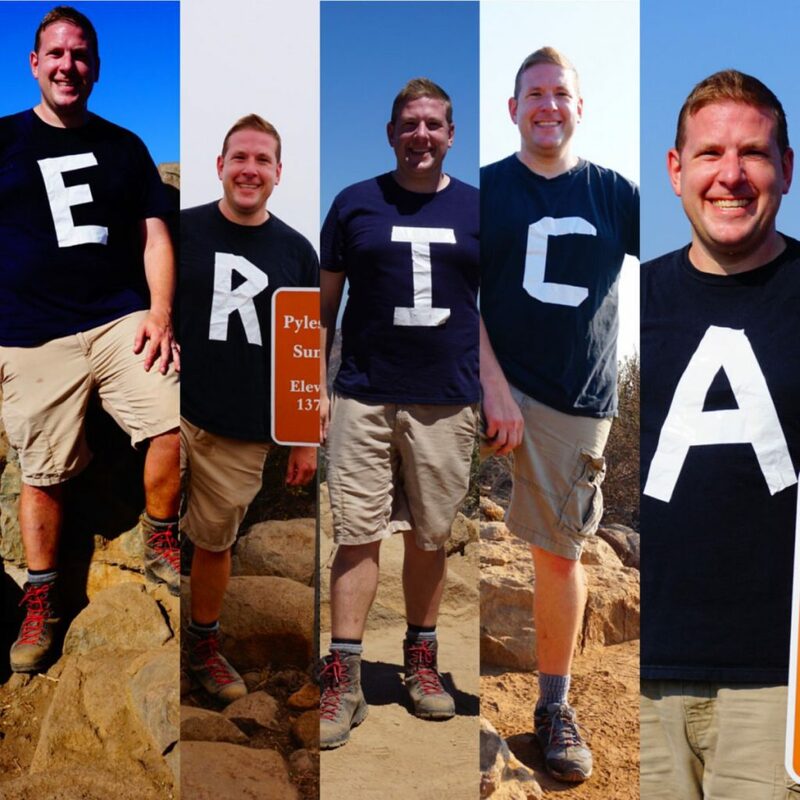 Please see the attached picture collage of us reaching all 5 peaks. My son is very excited to get his certificate and pin. His goal was to complete the challenge before he turned 10 years old. His birthday is on 4/24/16. I just want to say the 5 Peak Challenge is a great idea and I’ve told a lot of people I know about it. Most importantly, it was a wonderful bonding experience between my son and I. Something that we’ll remember forever. sucessfully completing the 5-Peak Challenge at 1:00 p.m.! on completing the 5-Peak Challenge! on Dec. 13, 2016. Congratulations to you both! became number 5,000 to complete the 5-Peak Challenge! Hey everyone, check out this must-see video! 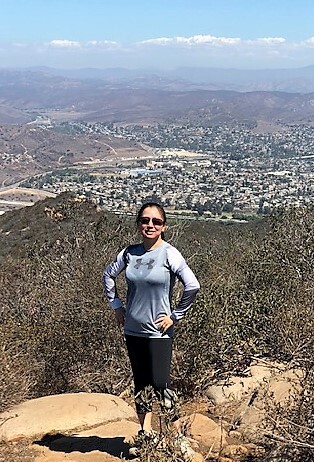 5 peak challenge in Mission Trails Regional Park, done in 3 days. Day 1:Kwaay Paay. 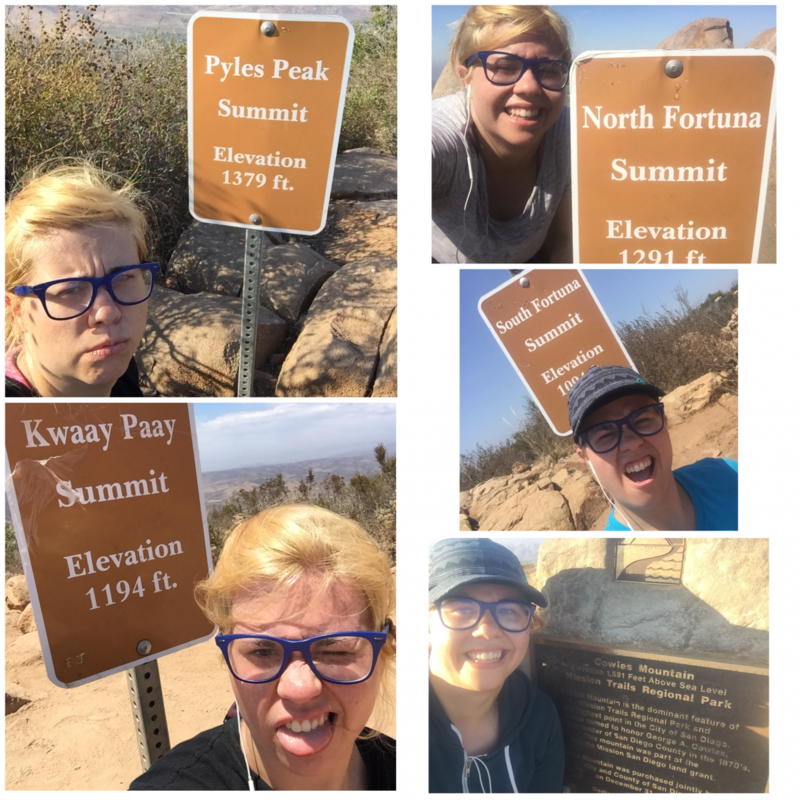 Day 2: Cowles Mountain and Pyles Peak. I did this challenge in honor of a very special lady I left back in Japan. We are both Active Duty Navy and I met Yadi on Mt. Fuji. 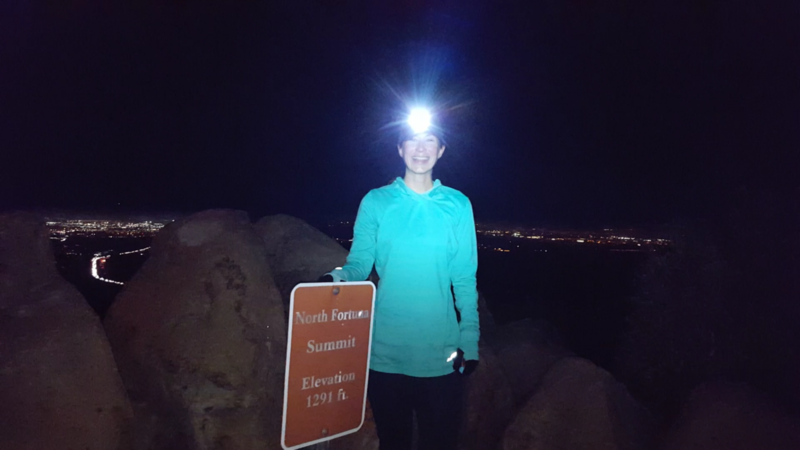 Kelly Johnson completed the 5-Peak Challenge on May 24th in style! June 22, 2017: My name is Rian William Molumby and I completed all 5 in honor of my student’s birthday, Jason Lyon, who passed away 18 months ago from brain cancer. He impacted all of San Diego with his positive attitude through it all, turning something terrible into a blessing. 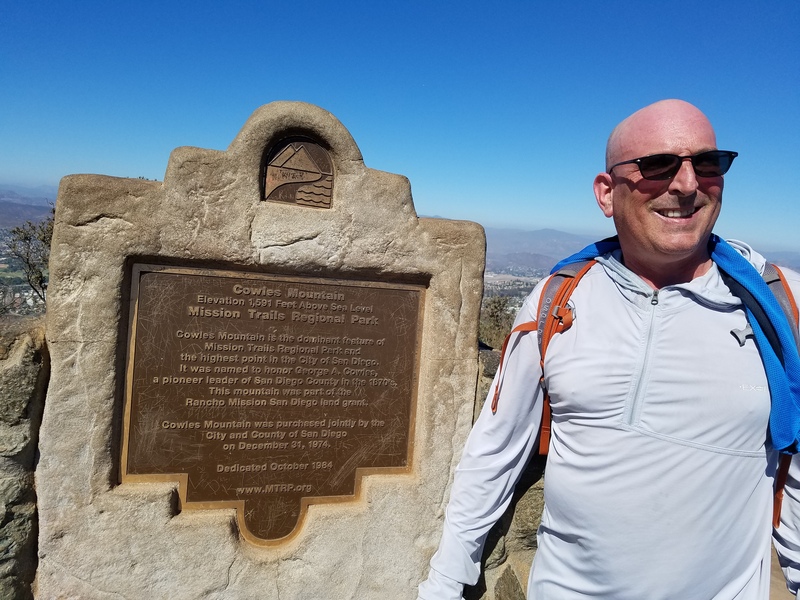 Keefe Reuther and his green friend completed all five peaks on June 10, 2017. On 11/04/2017 I completed the five peaks challenge by summiting Kwaay Paay under the full moon. This was a huge personal journey for me. It started in February of 2017 with the decision to make healthier life choices, and to spend more time outside. I’ve lost 80 pounds since that point, and I am about halfway to my goal weight. Each peak I’ve summited has represented proof that the changes that I made are real and tangible. 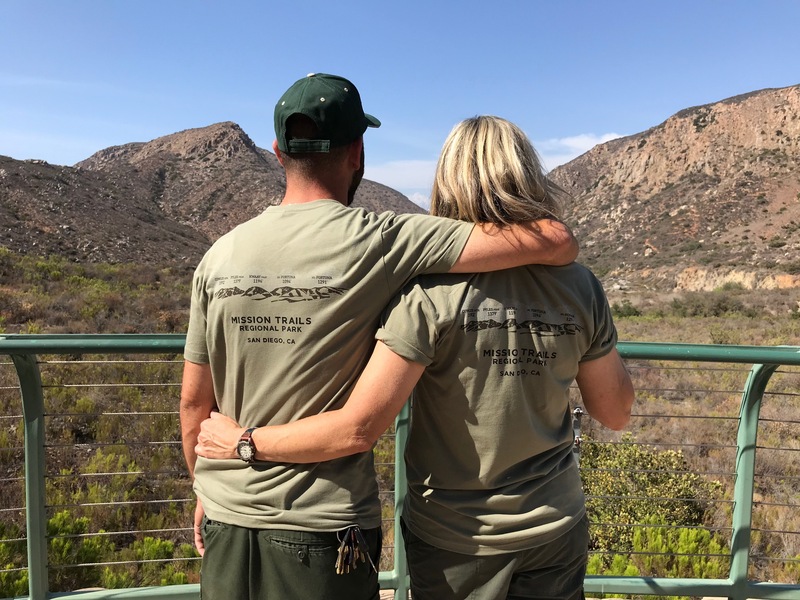 Hiking in Mission Trails has been a training ground for new skills, the site of many hours of self-reflection and the inspiration for day dreams about bigger adventures to come. Thank you for beautifully maintaining this natural treasure. Congratulations to this group from Mexicali who completed the Challenge on November 12th, 2017! Hello, my name is Aaron Ruis. The last time I went to the Doctor the scale stopped at 380lbs and that wasn’t high enough to weigh me. Something had to be done so I decided to go hiking with my daughter Soleil Ruis. The 5 peak challenge was our introduction to hiking. At 79 years young, great-grandmother, Charlene Rockefeller, and her daughter, Tammy, completed the Challenge on April 29th, 2018. 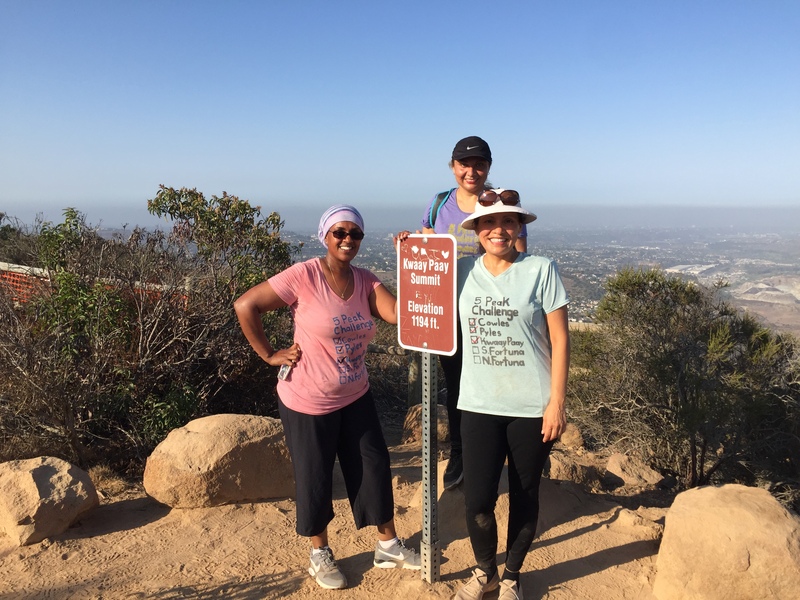 Join “Great-Grammy” and her other three generations of hikers on top of Cowles Mountain on October 29th for her 80th birthday! Athena Shudde & Kristi Evans (Pilates Instructor) doing the Side Plank on July 6th, 2018. Two and a half years ago, I was diagnosed with cancer (Lymphoma). I spent over a year getting chemotherapy, until it was determined that I was chemo resistant. The only thing that kept me going was walking. I went from barely being able to get out of bed, to walking to the end of my street, and then I finally was able to walk 15 minutes around Mission Bay. A year ago a clinical trial open up for which I qualified. It was my last hope. The CAR T immunotherapy seems to have worked. Again walking was my great reprieve. It gave me hope…it gave me strength. I made it up to walking 3 hours in my neighborhood. Still, it was flat. I found some hikes near my house that were pretty flat, and I dreamed one day of doing a “real hike” again. Then, one of my therapists told me about the 5 Peak Challenge. I am a teacher so I have the summer off. The first day of Summer Break I attempted South Fortuna, and made it. Over the course of 2 weeks, I made it up all 5. I felt such a rush of accomplishment. I just wanted to write to thank you all for maintaining such beautiful and challenging trails, and let you know what an inspiration and sense of achievement you provided me. 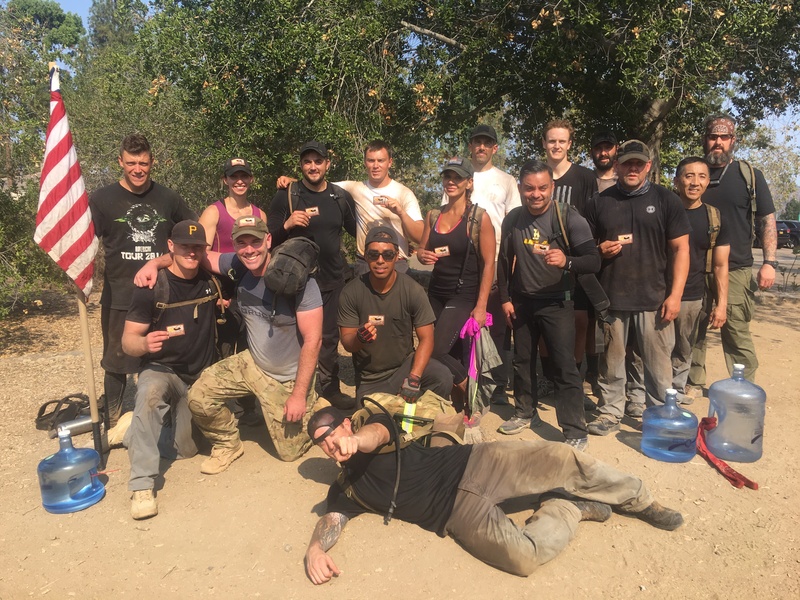 We completed the challenge overnight on August 10th, 2018. We started at 9:00 pm and went a little past 9:00 am Saturday morning. We hiked the week of the anniversary of the tragic downing of Extortion 17 in Afghanistan on August 6th, 2011. If you’re not familiar with this incident, it was a Chinook helicopter carrying 30 service members and 1 dog, including a large number of Navy Seals. In honor of these men and to keep their memories alive, we carried the pictures of all 30 men and the dog with us as we hiked the Peaks. We shot pictures on each peak of all the members of our group as well as each of the men killed when Extortion 17 was taken down. Our goal was to keep their memories alive for another year. Sent: August 11, 2018. 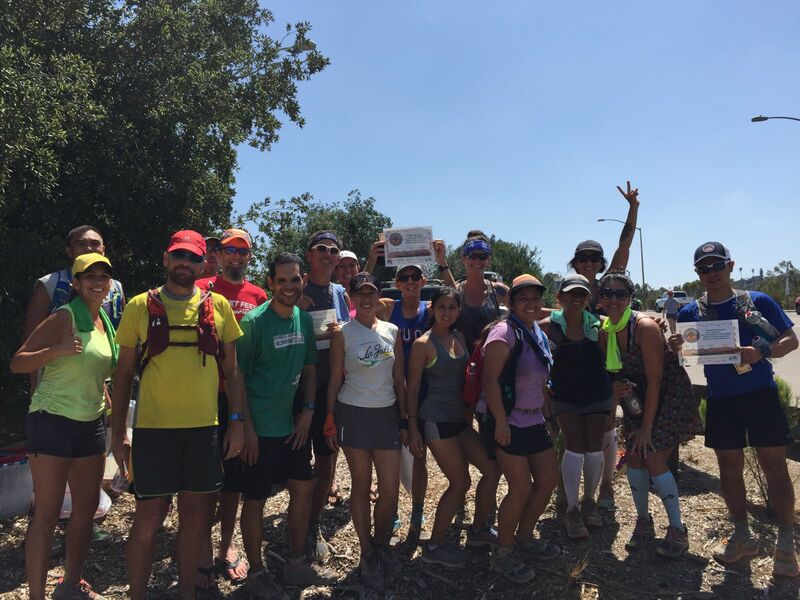 Me and my coworkers, nurses from UCSD Jacob’s 4th Floor Oncology Unit, completed the 5 peak challenge in under 24 hours. We decided to do the challenge for our team bonding experience and for those cancer patients who cannot. Sent: August 11, 2018. 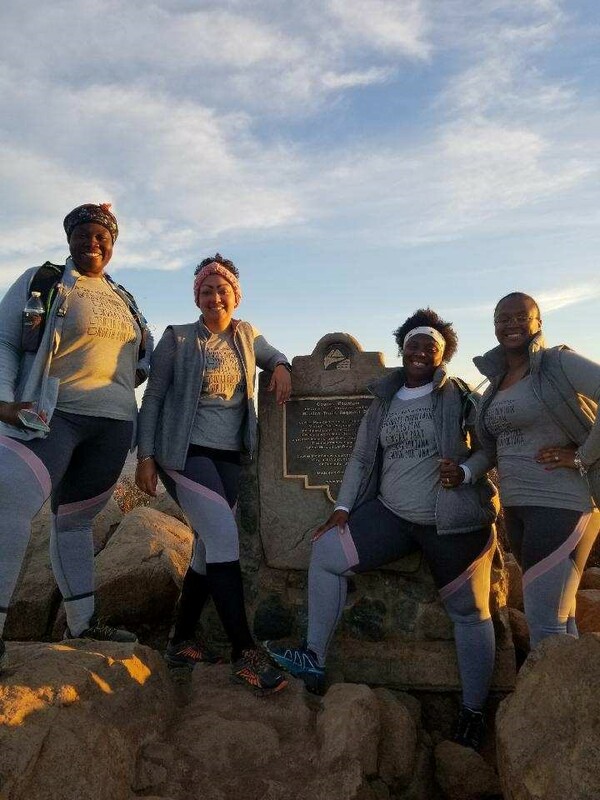 Today, I am proud to say our group of three has accomplished the 5 Peak Challenge as of Aug 11, 2018. 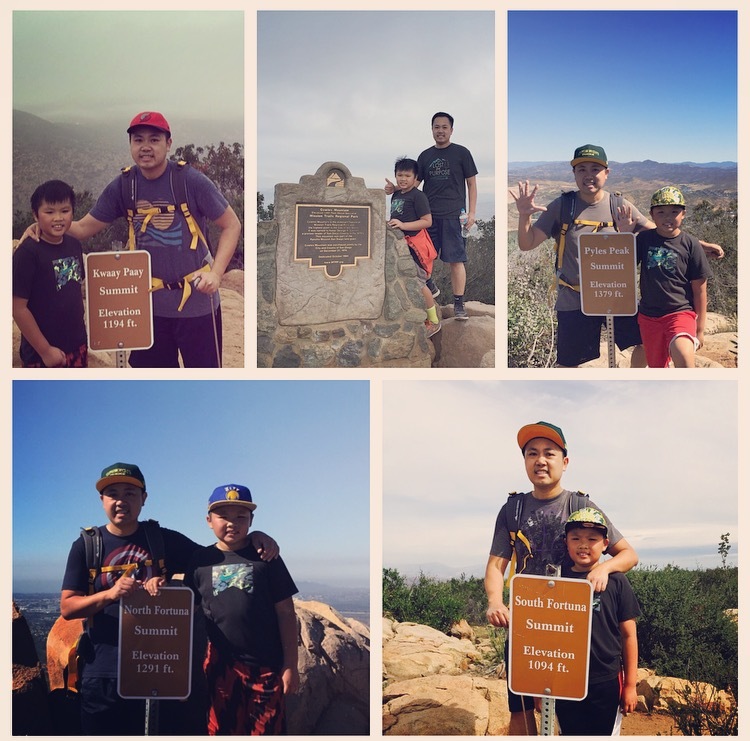 The 5 peak challenge has motivated us to continue forward with a healthier lifestyle. Thank you. Sent: Sept. 5, 2018. From: Kristen Hopkins. This is my husband (Gary) and I on our challenge hikes. We weren’t married when we started, but were when we finished! Life on this planet is amazing and spending as much of our time here in the wilds is important to us. We even got married at Glacier Point in Yosemite! Thanks to this challenge we saw our home in new ways & fell deeper in love together as we hiked these trails. We had so much grueling fun!! Definitely a challenge, but so worth it!!! Thanks for keeping the trails beautiful! We appreciate your hard work!! 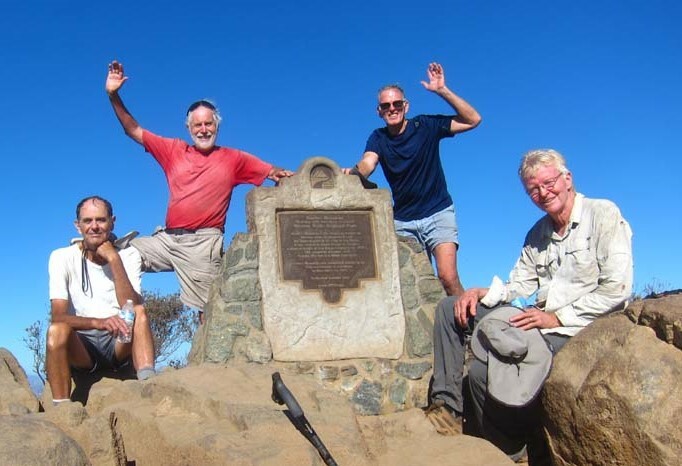 Congratulations to this hiking group of people age 70 and up, called the “Monday Maniacs,” who completed the 5-Peak Challenge all in one day on 9-17-18. WOW! CHECK OUT THIS 32-POUNDS LOSS TRANSFORMATION! Just like to share these pictures with you. Picture 1 (on left), November 2017, when I just started hiking at Mission trails, I was 156 lbs.! 2nd Picture (on right) is from a couple months ago. Hiking really keeps me healthier and happier. Hello. 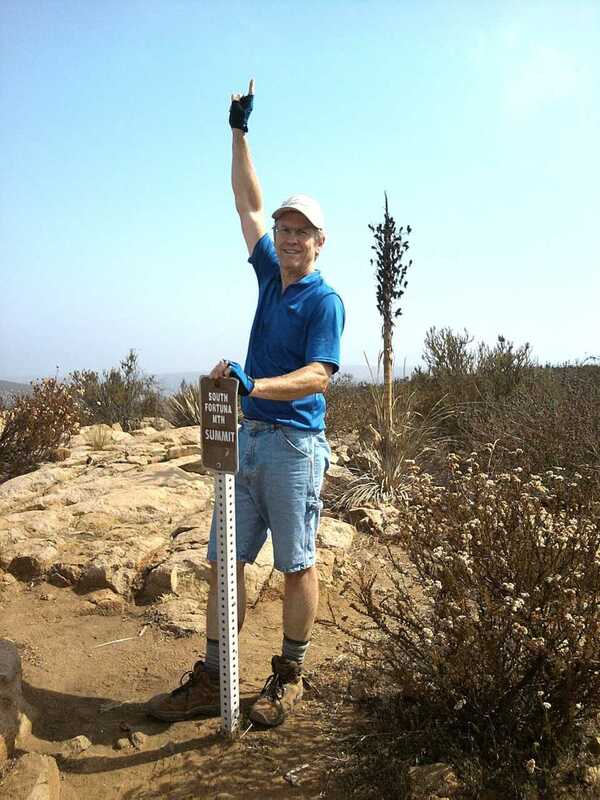 On Sunday, December 16th, I completed the 5-Peak Challenge. 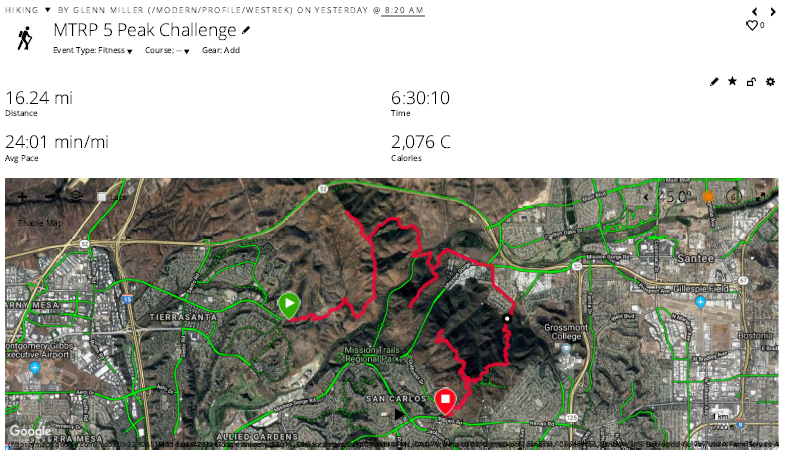 My original plan was to hike the route with a friend, but when he couldn’t make it, I decided to ramp up the challenge. I wanted to see how quickly I could complete the challenge as a continuous course. My total moving time was 03:39:31. I recorded and uploaded my route to Strava [see above]. I’m sure someone could complete this in a faster time, but I wanted to record this route to show what is possible and hopefully inspire others! I had a blast exploring this area, which was totally new to me, and I am so thankful for such an accessible wild space so close to San Diego. Hello. My name is Amanda Fowler [on far left]. I moved to San Diego, via military, 4 months ago from Florida. I have 3 sisters, who I’m very close with. I have been very depressed being so far away from home. Luckily by the grace of God, I have linked up with some great girl friends, with common interests…… Hiking. I knew moving here, I wanted to take my hands outdoors. And with my recent weight loss, what a better time. We have been hiking every weekend since the first week of October. It is definitely a “thing”. We have had good time, and of course bad, but all and all it’s been great. I have west coast sisters! I am truly blessed. 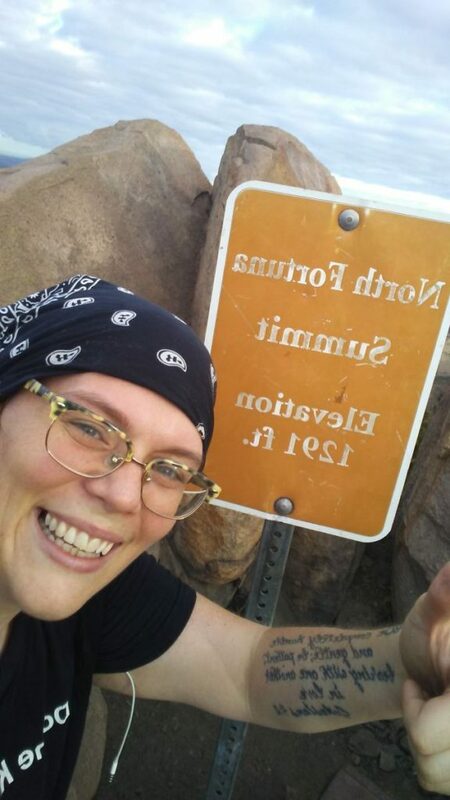 So, after 2 days, and 5 peaks…..San Diego is starting to feel like home. In a painful way. Lol. Started at 8:20 am and finished at 2:50 pm. Thanks for having this challenge. It was fun. 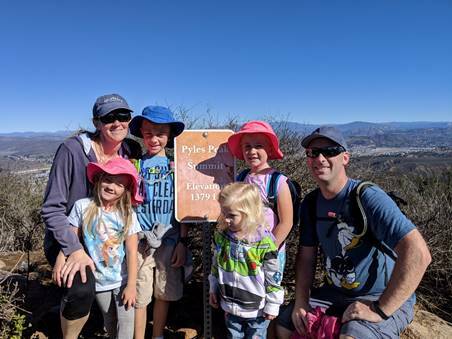 Our entire family completed the 5 Peak Challenge! As you can see we already picked up our certificates out of convenience on Jan 4, 2019. We wanted to thank you for this amazing challenge! We spent our Christmas break together, as a family, tackling the mountains. It was our goal for us all to complete and we did so in one week. Our children were so excited to participate, complete the challenge, and receive recognition. Our family loves hiking! This was a great lesson for us, but especially our children, that we can do difficult things. It is a challenge with young children, but it is worth it! This is such a great idea and we challenge more families to participate. 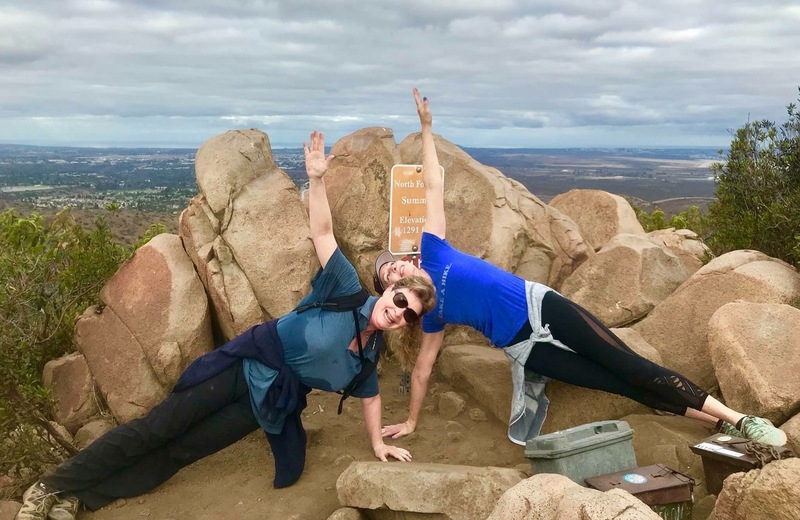 On Thursday, January 10th, mother and daughter duo, Annette and Shelby Bojevsky, were numbers 9,999 and 10,000 to have successfully completed the 5-Peak Challenge! Way-to-go, ladies! 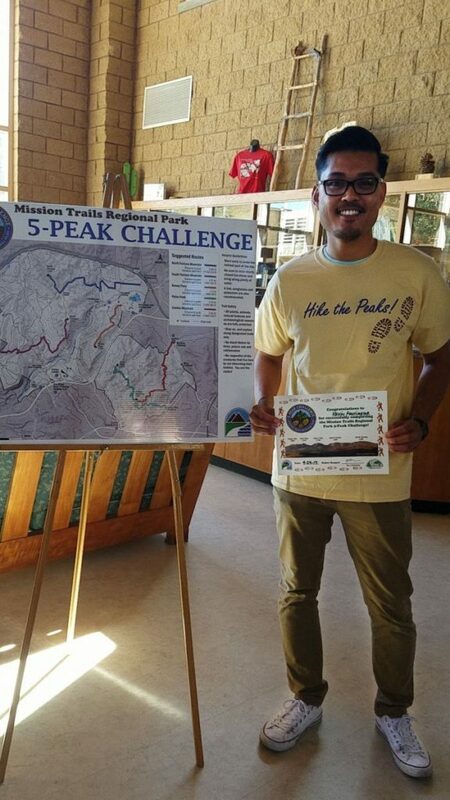 To honor and congratulate them on this milestone, the MTRP Foundation gave them each a 5-Peak Challenge T-shirt. The local Adventure-16 store in Mission Valley also generously donated a $50 gift card and a few hiking-related items, and REI donated some hiking items as well. I completed the 5 peak challenge with my 8 year old son. Im only 38 years old but I’ve been dealing with lots of knee and ankle issues so I haven’t been able to walk that far or work out. 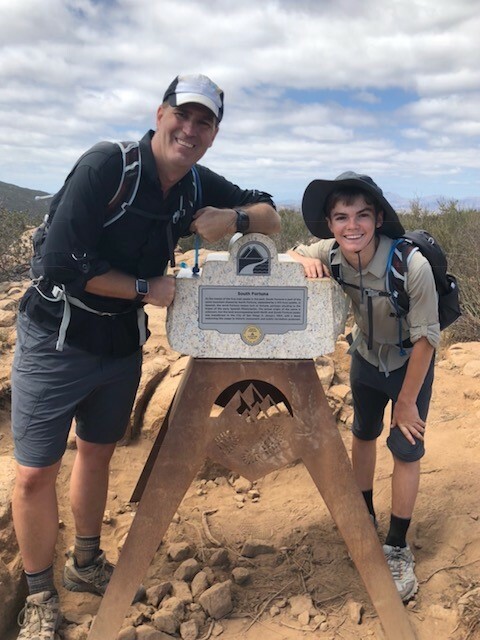 I saw this challenge and I wasn’t even thinking about taking it on but when I did the first trail with my son I was able to go through it, albeit with some pain towards the end. With a lot of icing and ibuprofen I was able to recover and did two peaks the following two weeks. So we were able to finish 5 peaks in three weeks. I am so proud of my son for being able to finish it with me. And I am surprised and feeling good about my newfound ability to hike long distances when I thought I wouldn’t be able to for a long time. My name is Ji Yang and my son’s name is Jeremiah Yang. Subject: Team Sheehan – We did it! 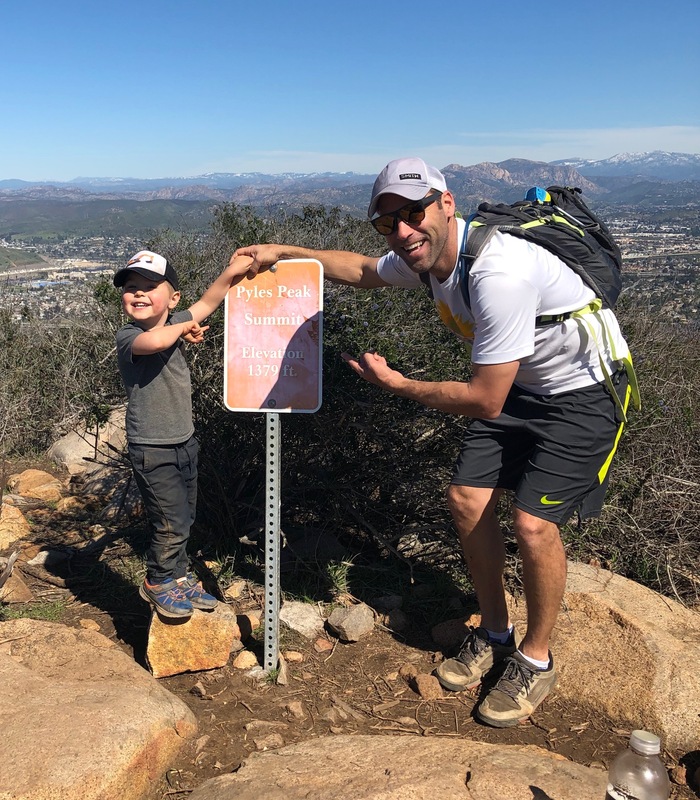 My 3 1/2 year old year old son Rylan (8/14/15) and I started the challenge on February 17th with Cowles Mountain, and climbed the final peak of North Fortuna this afternoon. We both had a great time and he was especially proud for getting up each mountain without his dad carrying him! 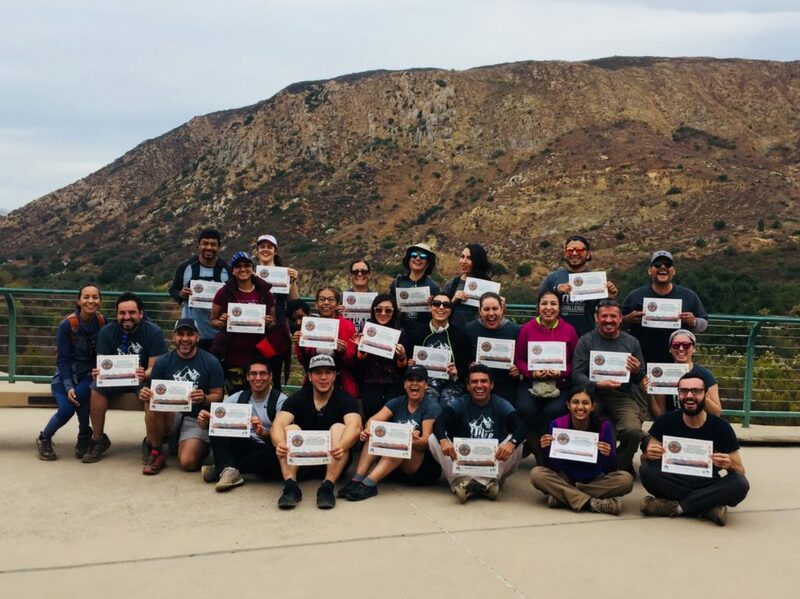 Thanks for putting this challenge together and taking care of our favorite park in San Diego! have completed the 5-Peak Challenge!